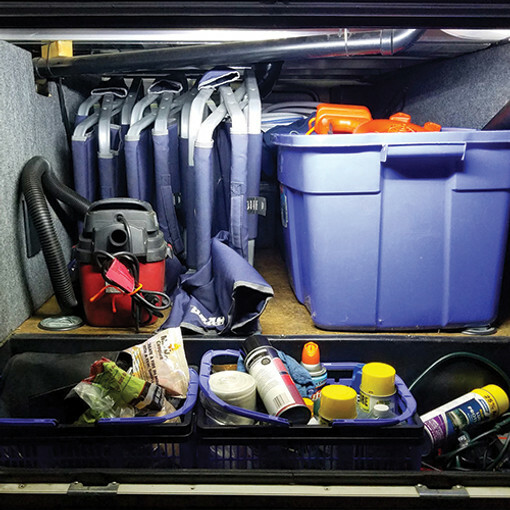 Most motorhomes and fifth wheel trailers these days have large, easy-to-access storage bays in the coach or trailer often referred to as "basements". Many pass all the way through the coach from one side to the other. One of the biggest problems with these large storage bays is the lack of sufficient lighting. If you've ever tried to dig through your storage bay at night or worse, along side the road at night, you probably have experienced the frustration first-hand. While some manufacturers offer storage bay lighting as an option, our experience has been that few stock lighting options are what we consider to be a fully functional lighting solution for these storage bays. Boogey Lights® offers both surface mounted LED lighting strips and surface mounted LED mini-pods to fit almost any basement lighting application.